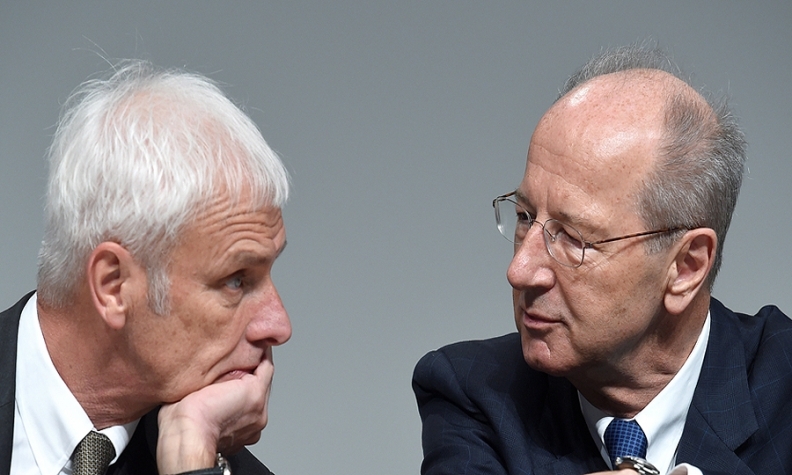 VW CEO Matthias Mueller and Hans Dieter Poetsch, chairman of the supervisory board, attended VW's annual shareholder meeting on Wednesday in Hanover, Germany. BERLIN -- Volkswagen Group's top two executives are being investigated over allegations of market manipulation, deepening the carmaker’s legal woes in connection with the diesel scandal. CEO Matthias Mueller and Chairman Hans Dieter Poetsch -- along with former CEO Martin Winterkorn -- are being probed by Stuttgart prosecutors over whether they were too slow in telling Porsche SE shareholders about VW’s emissions cheating, said a person familiar with the matter, who asked not to be identified. Porsche owns the majority of VW’s voting stock, and the men at the time had dual roles at the holding company and Volkswagen. Poetsch, Winterkorn and another executive at the automaker are already being investigated in a separate German probe over possible manipulation of VW stock linked to the crisis. VW is facing a barrage of investigations, lawsuits and customer complaints around the world after admitting in September 2015 that it rigged 11 million diesel vehicles to cheat on emissions tests. The scandal has cost it 22.6 billion euros ($24.6 billion) in fines and other expenses so far, and the final tally remains unclear. It’s the first time that Mueller has been the subject of a criminal probe connected to the diesel-emission issue. While prosecutors in three cities are looking into various allegations in the scandal, Mueller hadn’t been targeted. A VW spokesman declined to comment, while a Porsche SE representative said he had no information about the probe. A spokesman for Mueller said he wasn’t aware of the investigation. Lawyers for Poetsch and Winterkorn didn’t immediately reply to e-mails seeking comment. “We believe Porsche SE fulfilled its obligations to comply with capital market rules,” said Albrecht Bamler, a spokesman for the holding company. The Stuttgart probe comes after a complaint last summer over the matter from German financial regulator Bafin. Anja Schuchardt, a spokeswoman for the regulator, confirmed that the request was sent last year. Bafin also triggered the separate probe against Poetsch, Winterkorn and Herbert Diess over possible manipulation of VW stock. That investigation is lead by Braunschweig prosecutors. Poetsch, Winterkorn and Diess have denied any wrongdoing. VW has maintained it informed markets properly.